Like Merchant Ships: Need ham? Do you hear that? It's the sound of this month's budget breathing a huge sigh of relief. Just in time for a wedding breakfast I'm hosting, Harris-Teeter reduced a Smithfield spiral-sliced brown sugar beauty to 80-cents a pound. 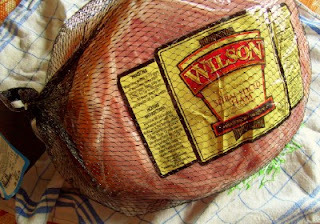 I thought it was a one-time deal, but Walmart has also chopped its ham prices in half: 80 cents/lb for Smithfield whole hams and $1/lb for these spiral sliced Wilsons. Both are good for another few weeks. A general rule of thumb: most meats are a good buy when priced $1/lb or under, chicken pieces aside. Yum! I might have to go and get one for the Mother's Day brunch I will be hosting this year. Thanks for letting us know! Going to check my WalMart now -- thanks for the tip! We love an after-church Sunday ham, and all the sandwiches and soups that follow. I found a good deal on ham at my local Aldi's this week. Appleton Spiral Hams were reduced $5.00 each. My ham ended up at about $1 a pound. Hmmm, maybe it's time for you to pull out the blow torch and try a little "honey baking!" I'm off to Wal-Mart. You can freeze hams, in fact, last year we found a great deal on a ham and had it for the 4th of July. Made the Miss Daisy Turkey Divan last night; it was delicious! the little spot of curry ramps the taste way up. However, never being one to Let Well Enough Alone, I looked at that 1/2 cup of cheddar on top and said, Oh No Way. That's not enough cheese. Proceeded to add about a CUP MORE. Don't anyone else do that. It created a huge thick cheese layer which prevented steam escaping from the veg cooking below. Result: watery, when it just didn't have to be. I believe in the original Miss Daisy cookbook the cheese is designed to be mixed into the rest of the sauce with either bread crumbs or cracker crumbs on top. I simply omit the cracker crumbs or use a bread crumb mixture I make from low carb bread crusts, toasted--for just us, at home. Talking of hams, we had a lovely budget surprise this month, too. The local Club hosts a meat raffle once a week, and January's prizes were hams -- dozens of them! For $3 I won a 6kg beauty -- and so did everyone else at the table.